Deangdeelert, Jirapatnakul, Pornmukda, Somboonsong and Yothchavit are just some of the names of the finest Thai chefs, bakers and restaurateurs in Philadelphia's environs. But one of the most revered appellations is Siriluck. Tanasit Siriluck began his career in Philadelphia as chef at parachute bedecked “Astral Plane” for almost a decade and a half, then on to “Friday, Saturday, Sunday” for another six years, before opening his own My Thai in 1990. In the midst of these foodish endeavears, he also found time to earn a PhD. in Computer Sciences, became a Professor of said Sciences at Temple and Penn State, and continues to be the Court Translator and Interpreter for Thai and Laotian testimony and documentation. He is a mentor to all. Therefore it is not unusual to see other Thai restaurateurs at My Thai enjoying his warmth and advice. The original building bricks are retained, floor to ceiling, on your right as you enter. On the left, long 15 pane windows predominate upon a wall painted “sweet tomato” red. “Scientifically proven,” opines the sagacious Tanasit, “people eat more when they see this color. It’s a matter of visual kinesics.” I notice that the entrance-way door is the identical creamy crimson. 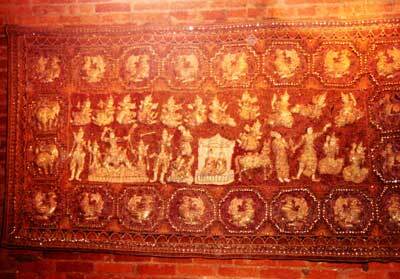 A huge and heavily metal-beaded Burmese three-dimensional wall-hanging adorns the brick and mortar. It’s a mammoth wedding scene with angels, and the birth signs (elephants and roosters) and birth stones (rubies and sapphires) of the bride and groom. “It weighs 900 pounds, and was sewn by two weavers, one starting on the left, and the other beginning on the right. Until the artisans met a year later in the middle, to join the bodies of the two to be married.” The entire establishment resonates in peacefulness and reverence for Thai culture. 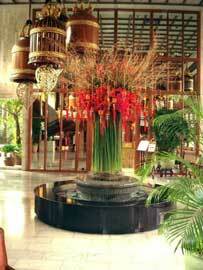 Sarongs serve as tablecloths, and the utensils are gold-plated bamboo-shapes. Candles supplement serenity. 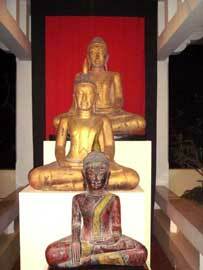 The Thai New Year falls immediately prior to or on April 15 every year. So, I annually attend a bountiful banquet at My Thai whose location at 22nd and South allows for last minute reworking of Income Tax Returns' figures and calculations for delivery, just before midnight, to the 30th and Market Street Post Office. At the restaurant, in these economic times, you must begin with liquidity. Soups are a must to quell one's overly taxed nerves. 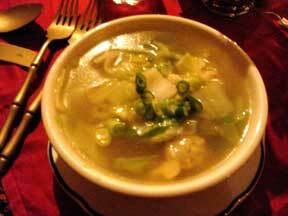 Try Chef Siriluck's amber and tranquil Wonton Soup (Keow Num: $4.50). A pristinely honest white bowl is gluttonously replete with sheared scallions, baby shrimp and pork-stuffed dumplings in a chicken broth made poignant by calm overnight simmering. The wontons are silken to the tongue, thinly transparent and elysian. On the other hand, to languish in tomato broth luxury, you may require the "My Thai Soup" ($4.50). The ingredients of blended codfish in coconut milk, red curry topped with home-made garlic croutons seem to perform a synchronized swimming routine in an opaque slightly spicy tomato-chicken broth. You swirl them about contemplating exemptions and write-offs. They give a brilliant accounting. 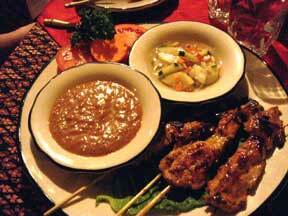 Chicken Satay or Shrimp Romanoff ought to follow. The latter are four baked shrimp wrapped cozily in spring roll skins, served with a plush sweet plum sauce ($6.95), while the former are three bulging skewers of marinated breast pieces surrounded by thick and grainy peanut sauce, and a bowl of wine vinegar garnished cucumber salad ($6.50). The chicken is as brazen as an IRS audit, and as murky when doused in the muddy thick peanut sauce, which of course, can become pickled pink morsels with the salad’s sanction. The shrimp are plum delicious and any auditor’s lips would be purple with envy. 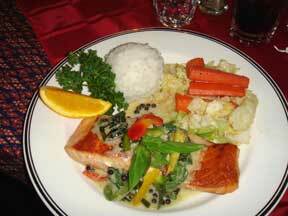 Steamed Salmon Filet ($15.95) is pompous and plentiful. When the shining pink morsel of fish passes between your lips, tens of flavors spice your tongue. The aroma is laden with the odors of a nearby orange slice, a half dozen small roasted carrots, peeping peppercorns and and a mound of sticky gleaming white rice. The salmon melts as if it were wetted cotton candy. 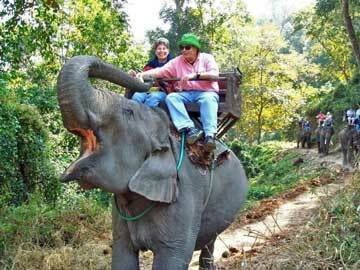 Then a short jolt of barely heated Thai aftertaste spikes at nostril height, clearing sideways to your ears. Swallow. Since there is hardly a chomp involved, you supplement with rice and carrots to add form and crunch. When all has been devoured, swoon. 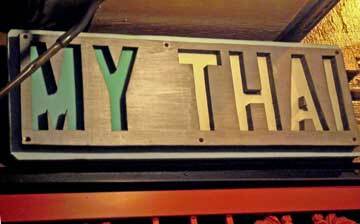 "Ooohs" and "Aaahs" and "Wows" can be heard from onlooking patrons whose demeanor and casual dress would indicate tendencies to be other than monosyllabic. You cut to the quick, while all remembrances of 401(K)'s and Roth IRA's are turning into innocuous desuetude. I will not mention the Shrimp Pad Thai ($12.50) except to say it has won awards. I shall mention that Sunday to Thursday’s 3 course specials are $14.95, Friday and Saturday $17.95 with differing choices. The 1040 upon which I've pasted "post-its" to mark the spots for signatures is by my place mat, in candlelight. Tanasit whispers over my shoulder as he peeks at my notations. "You are most lucky," he grins, "your bite is only 28%, not hard to digest." He brings an ice cream parlor glass of the house coconut ice cream piled high as my bank statements, and a bowl of corn-drenched rice pudding. "Eat all but 28%, it will help your waistline, and teach you a lesson for next year," he prescribes and forewarns. After having carefully proportioned and delighted in the luscious dessert offerings, I write my check to the United States Treasury, and prepare to sign it. I can still taste the smooth coating of Thai pudding at the base of my larynx, and sense the wisdom of Tanasit Siriluck as he pats my shoulders. “Sawadee-crup,” he exclaims, and then presses his palms, fingers and hands together upwards just below his chin. My signatures are written on all tax documentation as they should be after such Thai dining and Thai blessing: I write carefully, "Kinnaherrafekactadeducta Bockol."